The original hotel on this site was built of brick, and its name refers to the nearby Glass House, one of Collingwood's earliest factories, in Glasshouse Lane, near the Rokeby Street corner. The surrounding electoral subdivision was named North Glasshouse. In 1908, at the Licenses Reduction Board hearing, it was claimed that the present licensee was a teetotaller who was conducting the hotel better than it had been for 30 years past. The hotel was 'in the centre of a thickly populated locality' and there had been absolutely no Sunday trading since Robert Muirhead took charge, and business had increased. The Glasshouse was permitted to continue trading. 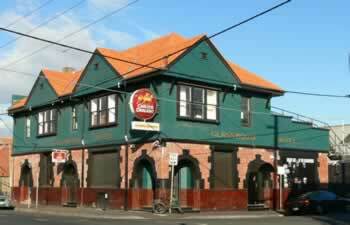 Carlton & United Breweries acquired the old hotel in 1910, and rebuilt in 1917-18. The current building, despite some alterations, remains an eye-catching and unusual late Edwardian structure. The ground floor walls were originally face brick while the upper floor employed roughcast. There is a brown glazed tiled dado with decorative top and bottom courses. The roughcast has been painted over and some windows have been altered.